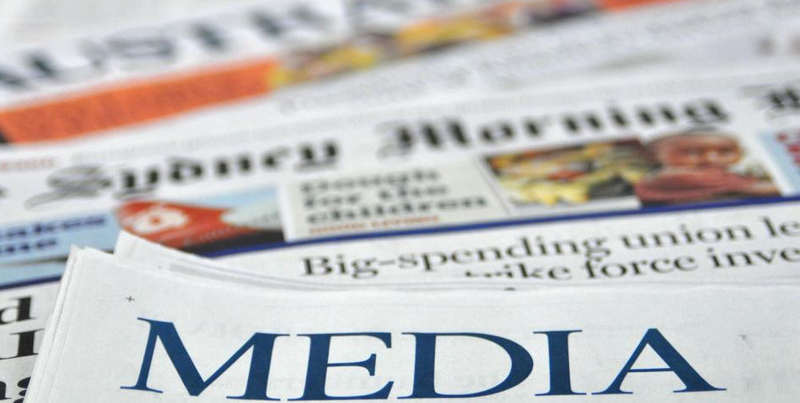 The media and the property markets of Australia have a love-hate relationship. Similar to the broken marriages that litter our society, it all starts out innocently and they had some wonderful times early on. But when things turn sour, it gets really ugly as both parties race to the bottom. And in the end there is almost always a winner and a loser. When times are good property is portrayed as the “darling of the economy”, publishing story after story of record sale prices and wealthy real estate agents. This invariably strikes fear into everyone who hasn’t bought a property, creating more demand for real estate and continuing to help drive prices up. As we are seeing in Sydney and Melbourne, these markets have turned and the media wants its pound of flesh. Property is still a hot topic but for all of the wrong reasons. Whether it be stories of poor clearance rates or low sale figures, or a common favourite is to quote experts and economists on forecasting just how much these markets are going to drop in the coming months and years. These are enough to scare the pants off anyone thinking about investing or buying their first home. And please note the word “could” continuously popping up. There is nothing definitive about “could”, but it is a very handy word to use if you are speculating about something. In September, Channel Nine’s Sixty Minutes aired their story “Bricks and Slaughter”, a blatant scare-mongering story on the outlook of the Australian property market. They interviewed and quoted some of our best economists and property experts, but they used clever editing and paraphrasing to get the story that they wanted. Louis Christopher from SQM Research was interviewed for almost an hour, where he discussed a broad range of topics. His perspectives are always well grounded and backed by research, making him one of the best commentators in the property industry. Instead they used one minute of that footage, portraying his views to be far bleaker than what he has said in the interview (we need context in what we hear and say. If you remove it you can shape any piece of information in the way you want it to be received by the audience). Sixty Minutes claimed that we would see price drops of 40% across “Australia’s property market”. And the effect that this type of media was shooting for had its desired effect. People panicked, prospective buyers withdrew from the market, and sellers were wondering if the world was about to end. A leading real estate agent on the Lower North Shore received a call on the day following this story, from a woman who owns three apartments in Cammeray. “I’m selling them all! After that story last night I am getting out”. And she is. She is taking her three apartments to market one-by-one, and should have all three properties sold before Christmas. Why? The fear instilled from that Sixty Minutes story was enough to make her sell $2.5 Million worth of real estate. Ironically with more of this happening, stories like the one from Sixty Minutes not only report a drop but they contribute to it. Our markets are dictated by supply and demand so if you can increase the supply of properties for sale, meanwhile drastically reducing demand, then you can easily affect prices to start dropping. Mike Cannon-Brookes paid $100-million for a home in Point Piper earlier this year, setting a record for the country. The media have been all over this sale as it has been the largest Australia has ever seen. The previous record had been set earlier in the year by his Atlassian business partner Scott Farquhar’s purchase of a $73 million home right next door. So two of Australia’s richest guys under 40 have splurged $173 million on two side-by-side Point Piper homes, setting the record both times for the most expensive homes in the country. This is fairy-tale stuff and the media got a lot of mileage out of this, as they should have. Where we have been seeing a lot of negative effects from the media, the results from this story were reversed. Anyone with a waterfront mansion in Sydney just added 20% to 40% to their perceived value, thanks to the boys from Atlassian. The seed was sowed by the purchase, and the idea that their home was worth a lot more than a few months ago was driven by the media. Sydney and Melbourne are our two largest markets, so when the “Australian property market” is talked about it is essentially these two cities. Sure both cities have experienced meteoric growth since 2013, peaking in mid-2017 to early-2018 depending on the city and suburb. After a period of prices rising we usually don’t see much in the way of growth for a number of years. This is because property markets fluctuate in cycles. Peaks and troughs. Periods of growth, periods of stagnation, and sometimes periods of decline. The steam has well and truly come out of the Sydney and Melbourne markets, but we have a number of other capital cities and states that make up our nation. But the media keep sinking the boot into Sydney and Melbourne, creating more fear and uncertainty in these markets, removing more buyers from the market and causing more concern for people selling. Have You Seen the Stock Market? Property and shares have long been compared as investment options. Both have their merits and both have their faults. Australians are usually divided in either concentrating on shares or property as investment vehicles, with a much smaller percentage properly diversifying across the different types (along with other investment products and methods). The ASX has seen a very rocky road this year, with the last few months causing a lot of pain for a lot of people. 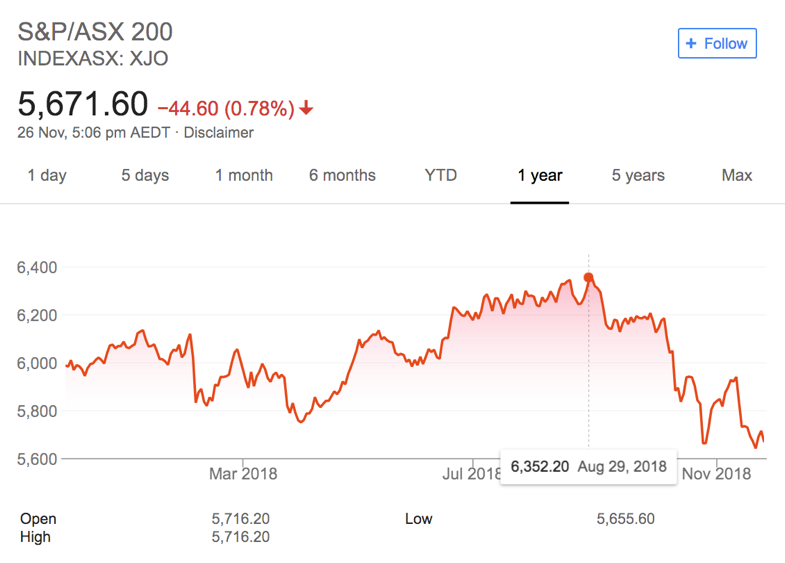 If you look at the performance of the ASX 200 over the past 12 months, graphically it is pretty obvious that since the peak in late August it has been on a slippery slope south. It surprises me that the property market continues to be the main drawcard for the Australian media, despite there being much more pressing issues and stories to cover to give the public a more balanced understanding of what is happening in our economy. In a nutshell, “like it or lump it”. The media is so powerful and all-encompassing that it is something we just need to be aware of and take as we want. With the saturation of social media and smart phones, the influence of the media has only seemed to increase as it is has evolved well with this digital age. At the same time there has never been so much information readily available to the masses. It is a wonderful time if you have a thirst for knowledge and are diligent in finding credible sources for your information. Podcasts, blogs and newsletters from experts that you respect (and who don’t have an ulterior motive) are a great start. Be selective with who you listen to and read, and don’t be scared to challenge any perspective you feel is not right. The media has a place in society. It always has and it always will. Property in Australia has almost become another sport that is reported on, and will continue to be a huge drawcard for media outlets to appeal to a larger audience. Just take the information on face value and do your own research to get a true understanding of what is actually happening out there.